If you’ve never been on a Friday Night Lights before, what are you waiting for?! 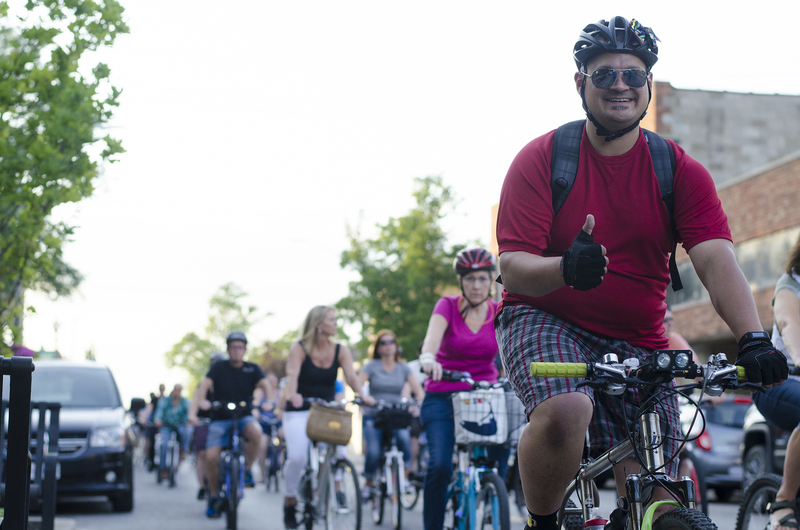 They’re a night time bike ride and are a sight to see and an experience to be a part of. 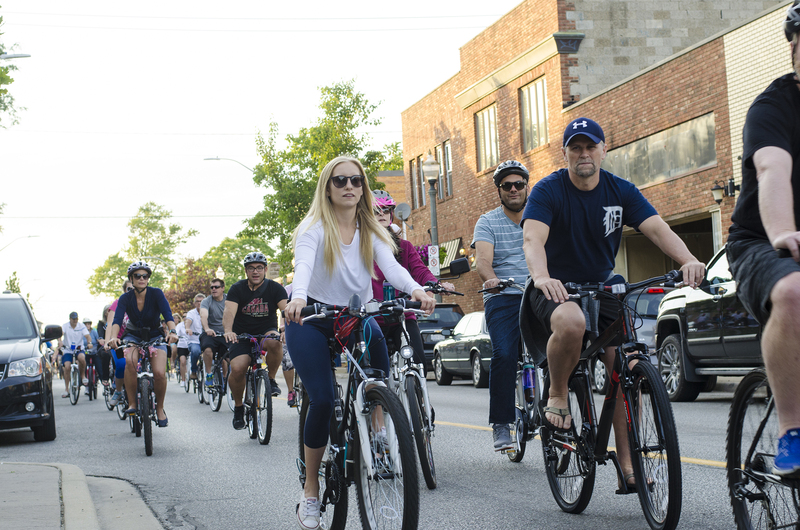 We get a couple hundred folk each ride who deck out their bicycles in colourful lights, fun bells, decorations and more as we visit 3 establishments in Windsor, Ontario. We’ve even had some disco balls and a chandelier attached to some bikes. It’s crazy! For more information on Friday Night Lights, be sure to follow WindsorEats on Facebook. You can purchase tickets in advance. A good ride is a smooth ride. Make sure your bike is in good working order before you arrive. Check for low air, oil on the chain, etc. If you don’t feel like doing it yourself, Infinity Cycle will have a tent on site offering those services for a small fee. That’s what these rides are all about! We always encourage bicycle safety and the use of a helmet. It’s against the law to consume alcohol in public spaces. To keep the ride in good standing with the community, we ask that you respect it. We bring a lot of people to these businesses in one short, quick burst. Using cash helps reduce the amount of wait time to order any beverages or food. Friday Night Lights is a must-try experience you have to participate in when visiting Windsor, Ontario. This rule is so important. We have a team of Corkers on each ride that help ensure the safety of riders. Listen to them. Corkers will try to block busier intersections that are critical to ensuring the safety of our riders while they traffic lights are green. While we do take an entire lane, we ask that you stay to the right of the lane so our corkers can safety pass by you on the left hand side. This is important for everyone’s safety. There will always be Corkers at the front of the group who are making sure everyone is safe and on the route. Do not ride in front of them. We need to follow the rules of the road. Unless instructed to by our corkers, be prepared to stop at intersections with traffic lights and stop signs. It’s not legal to ride on the sidewalk. Enough said. Shout out signals, stops, turns, let riders know you’re passing on the left, point out glass or potholes. Basically, be courteous. Didn’t your mamma teach you any manners? Be nice to people and make some new friends. While it’s now the law in Ontario to have a light and bell on your bike, we want you to take it one step further and bring lots of lights to light up the night! If you see a gap forming, ride a little faster to keep the group together. Bring a bottle of water to keep on hand while you ride. It is up to you to ride in a manner that ensures your safety and the safety of those around you. Do we really need to explain this? It’s just not acceptable. Call the litterbugs out and help us keep the city clean and the ride in good standing with the community. It’s a night ride, so light up your bike, helmet, whatever you want! We’ve had people show up with themselves covered in glow-in-the-dark paint! We are pretty excited about these rides and are getting a great response from everyone. We encourage everyone to come out in a good mood, join us and have a great time!